The health benefits of eating currants are huge. Blackcurrants for example, are especially rich in Vitamin C, and are said to prevent such ailments as joint inflammation, eyestrain and urinary infections. What’s more, they take up little space in the garden and are a doddle to grow. Currants come in three colours: red, white and black. The most common type grown in the UK is black, and this is the healthiest of the three varieties. 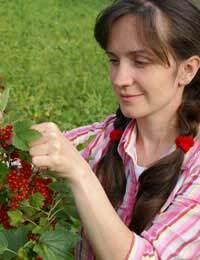 The growing requirements of all currant bushes are fairly similar, so you can enjoy all three types with minimum fuss. Redcurrants have beautiful red, tart berries. The whitecurrant has translucent berries with a delicate flavour, and the blackcurrant is deliciously sweet. The bushes are exceptionally beautiful and make an attractive addition to the garden. The leaves of the plant are a deep bluey-green and you can train them to grow in a cordon, or a fan shape. The plants’ leaves can be damaged by strong sunlight, so it’s best to grow them in partial shade, in a sheltered spot. They enjoy a moist, but well-drained heavy soil, so will do well in clay but less so in sandy soils. If you do grow them in clay, ensure you incorporate plenty of organic matter, as this will improve drainage and prevent them from getting waterlogged. Blackcurrants enjoy similar growing requirements to red and whitecurrants, but you’ll need to feed blackcurrants more to get a good crop of berries. They are also more tolerant of waterlogged soils. Blackcurrant bushes can easily grow from cuttings of around 20cm in length. Simply buy the cuttings from a reputable supplier, then fill a large flowerpot with a mixture of garden soil and compost and place the cutting in the centre in autumn. Push 3/4 of it down into the soil and firm gently, so it stays upright. Leave the pot outside during the winter months and you should start to notice signs of life in spring (the buds will move, and grow). You can then either leave it in its pot for the first year, or transplant it into your garden as a young plant. Dig a large hole to allow the roots to spread easily, and mix in a little leafmould or garden compost. Water the hole well, place the bush inside, making sure it is upright, and return the soil, firming it securely and removing any trapped air pockets (this can be done by using your feet to tread around the stem). Keep them well watered during their first few months, and again during the growing season. Prune once a year in autumn and apply a thick mulch of well-rotted animal manure, compost or leafmould (this is especially important with blackcurrants as they demand more nutrients).Currant bushes look fantastic when in flower. The blooms are spectacular as each bud opens to reveal up to twenty tiny flowers. Most currants start to ripen from mid summer. They’ll be an unmistakable deep red, white or black and be roughly 8-12mm in diameter. It’s not necessary to pick off each individual berry when harvesting. In fact, this can damage the fruits, as they are very delicate. Simply snip of the entire truss, and remove individual berries once you’ve got them to the kitchen. Whether you’re interested in healthy eating or just want an attractive shrub in your garden, growing currants couldn’t be easier. You’ll be rewarded with delicious, fresh berries that have many culinary uses.